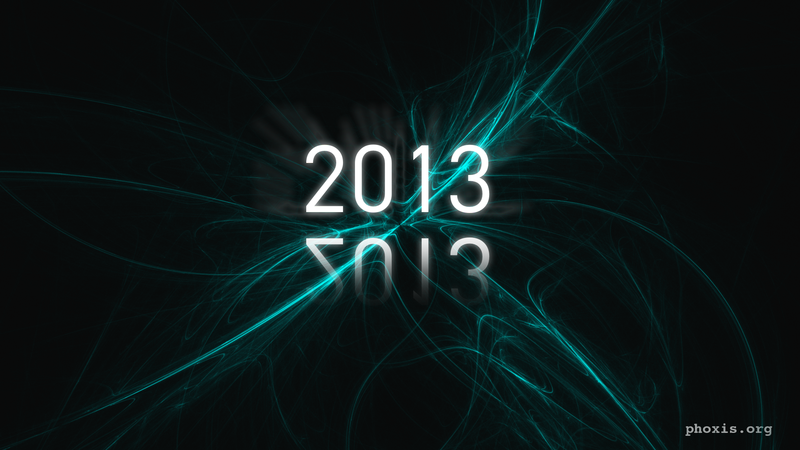 This time it is a new year wall paper, although i am late for it. This is also a simple wallpaper, no complex operations required. Again i have used the flame plugin and had the X effect. Follow the guide and see if you like it. Create a new image with white background, at your best monitor resolution. 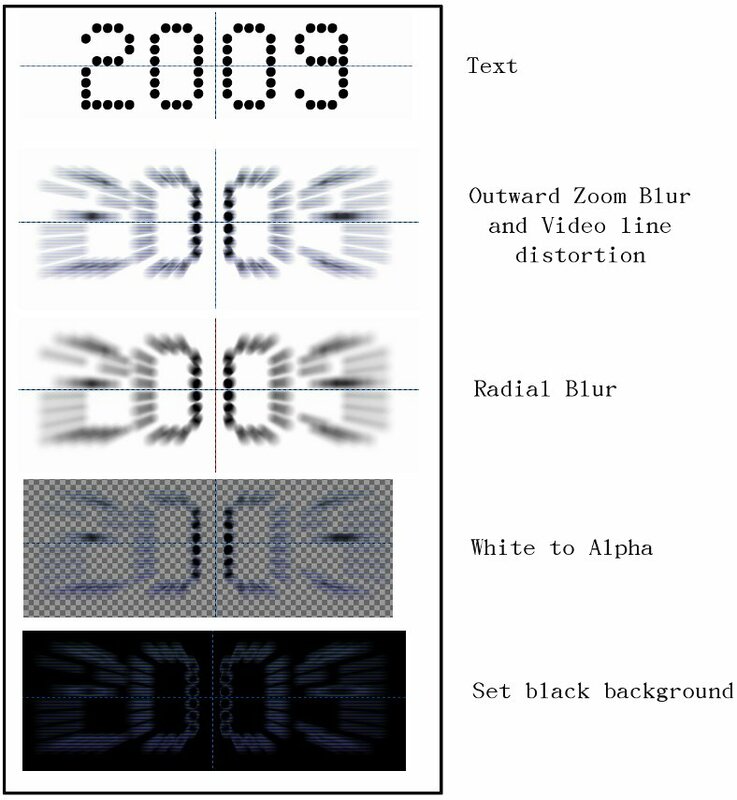 When applying the motion blur be sure the center of the blur (x,y) is selected on the center of the text, so that the blur effect is symmetric on both the sides of the text. Here also select the center so that it is on (almost) the center of the text. After this we have finished with the “2009” layer. Now select the 2009 layer in the layer tool box and colorify the layer from white to alpha, so that only the 2009 text is there. Crop (or autocrop) this layer and isolate the text, and make the layer smaller. Add a new layer with black color #000000, name it “back” and shift “back” to the bottom. 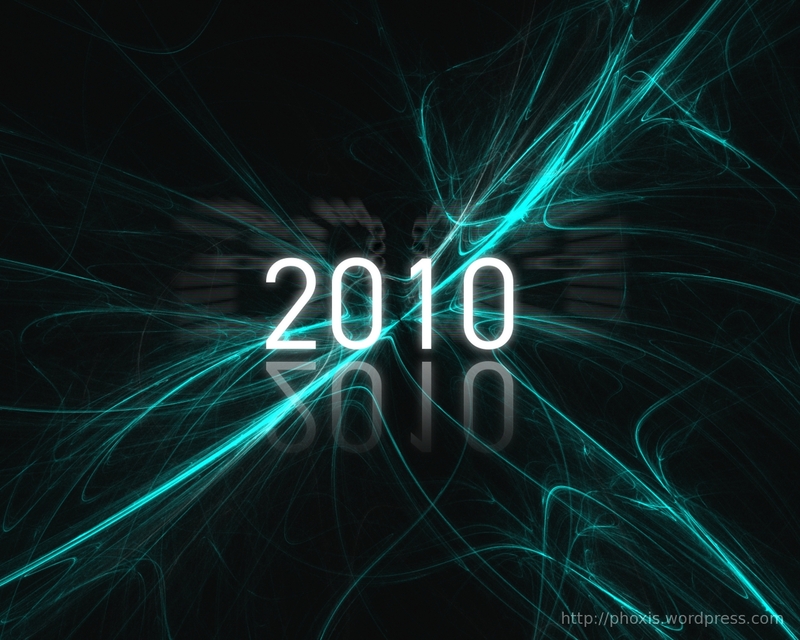 Apply softglow to “2010” . Keep the glow radius medium. Then select the Flip Tool from the tool box, select flip type to Vertical, and click on the 2010_ref image and flip the layer. 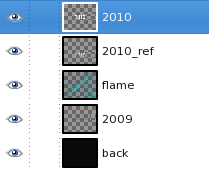 Position “2010_ref” under “2010” layer, so that the “2010” layer bottom almost touches the “2010_ref” layer top. 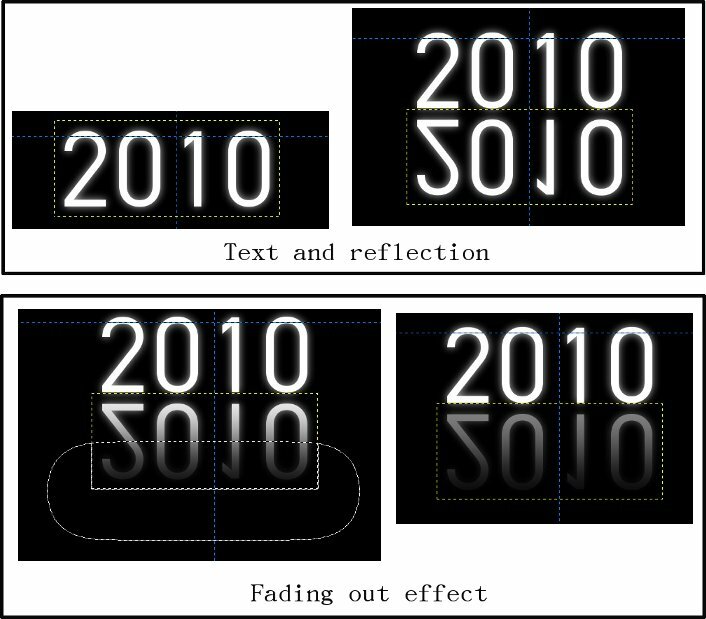 Select the below portion of the “2010_ref” layer including the bottom half of text. Feather selection to about 150px to 200px, and then press delete button once to get the faded effect. The above step screenshots are integrated into the below image. Now the flame part. Either you can generate your own flame pattern or use the one i have generated, by downloading it from the attached files section. To use it, load the file, download the file, open the flame dialog box, click open and browse and select the file. First create a new transparency layer, where the flame will be rendered. Name this layer “flame”. Keep this layer below layers “2009”, “2010”, and “2010_ref” and top of “2009” and “back”. Then apply flame on it. When applying the flame, zoom the flame from the flame control box, so that the flame completely fills up the layer. Adjust the zooming of the flames to get the desired effect. Also adjust the gradient for different colours. I have used the “Neon Cyan” gradient. Select this from the gradient tool from the tool box, then from flame control box select custom gradient. If the flame will look very flashy, so we will make some adjustments to it. Open the curves box and select the alpha channel and the. Keep the high tones as it is, and decrease the low and mid tones so only the high tones gets which are highlightes the flame is prominent. Blur the flame once, or leave it as it is. Blurring the flame will lead in a blurry and blunt flame formation, although it is not bad, and depends o taste. After this the image and the layers might some reposition on the screen, like you might like to place the layers in center of the screen, or on the upper part. And I have re-coloured the “back” black later from #000000 to #0a0a0a . Although this might seem unnecessary , but this visibility affects the picture. The less prominent and almost invisible parts of the flame is not visible. Also the flame might need some tuning. The layers might need some resizes etc. And we are done. Have a look at the final layer layout and then checkout the final product. Thanks for posting…looks very cool. Im going to try this. thanks for tutorial, how make 3D with GIMP? what a beautiful wallpaper you have, sweet and i like it, thank for sharing. keep up the great work. nice one..simple but cool.. will try that someday..thanks! No problems at all. All the posts are licences under Creative Commons Attribution-Share Alike 3.0 Unported License , as stated in the https://phoxis.org/about/ page. Also try some more innovations on this one . Hi there, thank you for this tutorial, however, you had me confused all over the place and I simply gave up on this one. The outcome you did looks great. Too bad I was not able to finish this one. Hello there. I can help you where you lost the track.